In 2018, the voters of Washington State approved WA Initiative 1639 which, among other things, requires the successful completion of an approved firearm safety training course by all residents wanting to purchase ANY semi-automatic rifle (including rifles like the Ruger 10/22). If you would like to read a summary of I-1639 prepared by Washington Policy Center please click here, or if you would like to read the full text of the initiative please click here. FOR THIS COURSE DATE ONLY—– Kaery Concealed has teamed up with criminal defense attorney and defensive use of force subject matter expert, Terry Johnson of Firearm Legal Protection. During this course, Mr. Johnson will shed light on the legal implications of I-1639 and will be available to answer your I-1639 related questions. 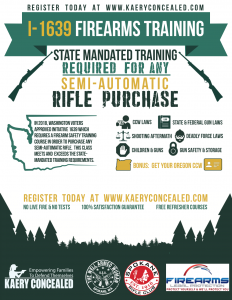 Kaery Concealed has designed I-1639 Family Firearm Safety as a special course to not only meet, but to far exceed the state-mandated requirements. In addition to exceeding the I-1639 firearm safety training requirements, we have designed this course to meet the requirements for obtaining an Oregon Concealed Carry Permit. No live-fire and no test required during this four hour course. At the conclusion of the course, attendees will be issued proof of training that satisfies I-1639 requirements. This is a terrific opportunity for citizens who would like more information about I-1639 and how it will impact their future. This course is also an approved training course for responsible citizens that would like to obtain an Oregon Concealed Carry Permit. Why would someone want an Oregon CCW permit? Great question! Oregon accepts only their own concealed carry permit which means they will not honor carry permits from other states so individuals that want to travel to or through Oregon with a concealed firearm (on their person or in their vehicle) need to have an Oregon CCW. Is I-1639 here to stay or will it be overturned? Although most responsible firearm owners are sickened by the passing of this severely restrictive initiative, the National Rifle Association is advising Washington residents to prepare to live with the initiative for a minimum of five years while some of the laws enacted by the initiative are challenged through the courts. Most legal experts maintain that although a few sections of the initiative may be thrown out, the majority of the sections will remain part of WA law — particularly the training requirement addressed by courses such as this. Because we are the first training academy in our area to offer an I-1639 Approved course, we strongly encourage signing up for the course well in advance as we expect these classes to fill up long before the class date. All 130 spots for the last I-1639 course we offered filled within 2 weeks. Pay once and train as often as you like for free! As with all Kaery Concealed courses, refresher courses are free, and every course comes with a 100% satisfaction guarantee or your money back. The text of I-1639 states that this training course must be repeated every 5 years — which means if you take the course through Kaery Concealed, you will pay for the course one time and you will be able to repeat the course at no charge (refreshers are always free). Kaery Concealed is a full time firearms and self-defense trainer who resides in the Pacific Northwest. In 2003, she earned a Master of Education (with an emphasis in Curriculum Development for the Gifted) from Whitworth University and has been teaching for more than 25 years. Kaery is an evidence-based trainer and provides practical, street-proven defensive products and training to educate, equip, and empower families to protect themselves and those they love. She has trained under some of the most respected instructors and thought leaders in the firearm industry to guide everyday students like yourself through the complex legal, moral, and social issues concerning the use of force in self-defense. Kaery is certified by various national and international self-defense training programs (Rangemaster, National Rifle Association, SABRE Pepper Spray, The Well Armed Woman, Department of Fish and Wildlife, Utah Bureau of Criminal Identification, and Law of Self Defense). Kaery, along with her other instructors offer corporate, group, and private courses for civilians every day of the week all over the Pacific Northwest. Kaery and her husband, Eric, are the proud (and often exhausted!) parents of 7 children ages 19, 17, 12, 12, 8, 7, and 6. As a family they enjoy water sports, camping, making music, reading, shooting sports, and ATVing all over the Pacific Northwest.